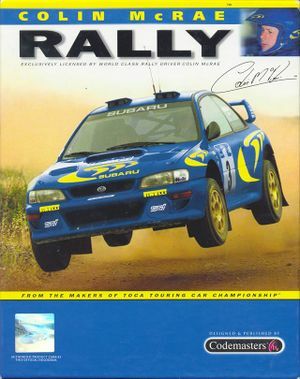 For the 2014 game, see Colin McRae Rally (2014). Needs unofficial patches to run on modern operating systems. Has some issues on Windows 7 and later. See the fixed issues and unresolved issues sections below. No longer available due to licensing reasons. You can skip the intro by launching the game from <path-to-game>\rally.exe. Can be forced through driver control or through dgVoodoo2. Frame rate is capped at 111 FPS. If the Windows 7 patch is installed, uninstall it by installing Patch 1.5. Download and extract dgVoodoo anywhere. Open the MS folder and copy its content to the game folder. Click "Add" and set the game folder. Set "Scaling mode" to "Stretched". Select your resolution and uncheck the "dgVoodoo Watermark" option. Open Rally.exe with a hex editor such as HxD. Press Ctrl+F, change the "Datatype" option to "Hex-values" and paste FF000080BF in the text field. If you can't edit the file because of no permissions, right-click Rally.exe, click on Properties and uncheck "Read only". Press Ctrl+F, change the "Datatype" option to "Hex-values" and paste 00000040 in the text field. Right-click Rally.exe, click on Properties, go to the "Compatibility" tab and select "Windows 98 / Windows Me". From the dropdown menu, select Properties. Once the window is open, select the Compatibility tab. Check the box next to Run the program in compatibility mode for. From the dropdown menu, select Windows 7. Repeat the process for <path-to-game>\rally.exe. (32bit users can skip this step) Type cd %WINDIR%\SysWOW64 and press ↵ Enter. Type regsvr32 ir50_32.dll and press ↵ Enter. Email received from Codemasters customer service. This page was last edited on 30 March 2019, at 00:13.